PACIFIC OCEAN - The Essex Amphibious Ready Group (ARG), with the embarked 15th Marine Expeditionary Unit (MEU), entered the U.S. 3rd Fleet area of operations (AOO), Nov. 30. The Essex ARG and 15th MEU are returning from a deployment that saw forces spread across the U.S. 5th, 6th and 7th Fleet AOOs while conducting maritime security operations, participating in theater security cooperation efforts, and providing ready forces that helped maintain conditions for security and promote regional stability in the deployed area. The Essex ARG and 15th MEU team, consisting of more than 4,500 Sailors and Marines, departed San Diego, May 11. During their scheduled seven-month deployment, they provided combatant commanders with a versatile sea-based expeditionary force tailored to a variety of missions, including being the quick-reaction, crisis response option in the maritime environment, participating in bi-lateral training events with partner nations, and launching airstrikes against ISIL as part of the Operation Inherent Resolve air campaign. "The Sailors and Marines of the Essex ARG/15th MEU team brought a uniquely flexible, adaptable and responsive force to the U.S. 5th, 6th and 7th Fleet AOOs," said Navy Capt. Clinton A. Carroll, commander, Amphibious Squadron (PHIBRON) 3. "The Essex ARG/15th MEU team was the 'Swiss Army Knife' of military capability across a wide range of military operations." ARG-MEU operations are designed and implemented to disrupt violent extremists' illegal activities such as hijacking, piracy, weapons smuggling, and human trafficking. As a fully integrated Marine Air-Ground Task Force, the 15th MEU is capable of operating across a wide variety of environments and mission sets, from humanitarian assistance to full-scale combat operations, with little advance warning. "The distinct ability of amphibious forces to gain access to critical areas anywhere in the world with ground, air, and logistics forces, enables the Navy-Marine Corps team to shape actions across the range of military operations, to resolve conflict, conduct humanitarian assistance, or combat the enemy in remote, austere environments that would otherwise be inaccessible," said Marine Corps Col. Vance L. Cryer, commander, 15th MEU. 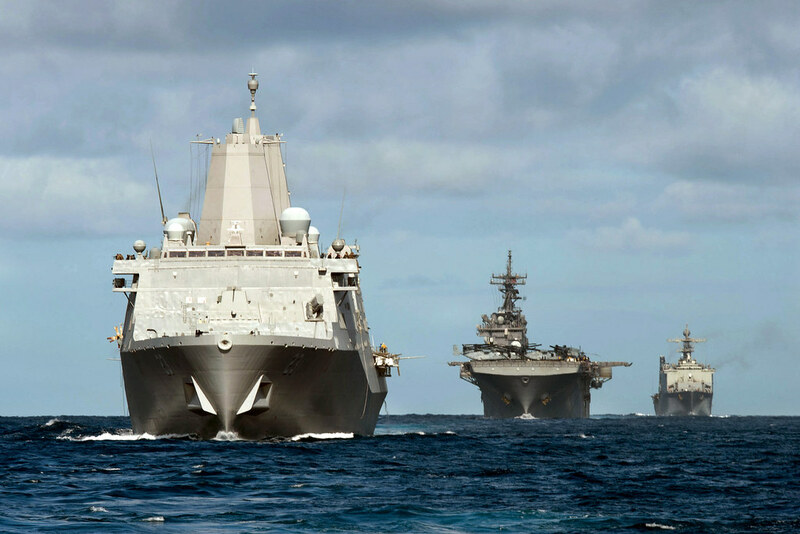 The Essex ARG is comprised of the amphibious assault ship USS Essex (LHD 2), the amphibious transport dock USS Anchorage (LPD 23), and the amphibious dock landing ship USS Rushmore (LSD 47). The 15th MEU is comprised of a ground combat element, Battalion Landing Team 3rd Battalion, 1st Marine Regiment; an aviation combat element, Marine Medium Tiltrotor Squadron 161 (Reinforced); a logistics combat element, Combat Logistics Battalion 15; and a command element. The "Smokin' Aces" of Helicopter Sea Combat Squadron 21 Detachment 1, homeported at Naval Air Station North Island, flew more than 1,600 hours of flight operations in the MH-60S Seahawk throughout the deployment.